If you're anything like me, you've tried all sorts of systems to organise your life. For me, nothing ever seemed to stick. I would use an online website to record tasks, and find myself stymied when ever I added tasks that didn't quite match up with the little buckets it asked for. I used a notebook, carefully delineated into different categories - but I'd find myself worrying that I was wasting paper, or not categorising tasks correctly. I've tried various iPhone to-do apps, but found them annoying to sync up to all my gadgets - and also was so slow to type into I'd find myself dropping things out. So this year I'm trying a new approach this year - I'm going to drop the ceremony. Using a notebook covers off point 1 easily. There's nothing faster or more convenient than good ole pen and paper. Have an idea for an app you want to build? Just jot it down in the notebook. Need to pick up some milk on the way home? 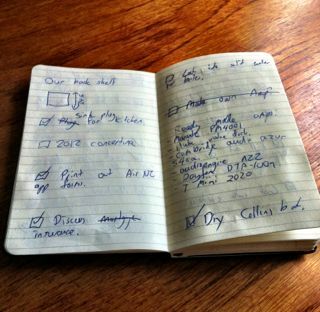 Jot it down in the notebook with a little box beside it so that you can tick it off. Need to write down someones phone number? Quickly write it down in there. Maybe later you'll put the number in your phone, but in the meantime it's captured fast and easily. And.. you'll find that if you just jot stuff down in there at random, then point 2 miraculously happens. Because you'll find yourself reading your little jots you'll see earlier tasks that you'd noted. Stuff that's important to you will leap off the page - stuff that's not important....won't. It's as simple as that! I've been doing this for the past two months, and it's been easily one of the most organised times of my life. I use a Moleskine notebook and any pen that happens to be lying around - blue or black, I don't mind.